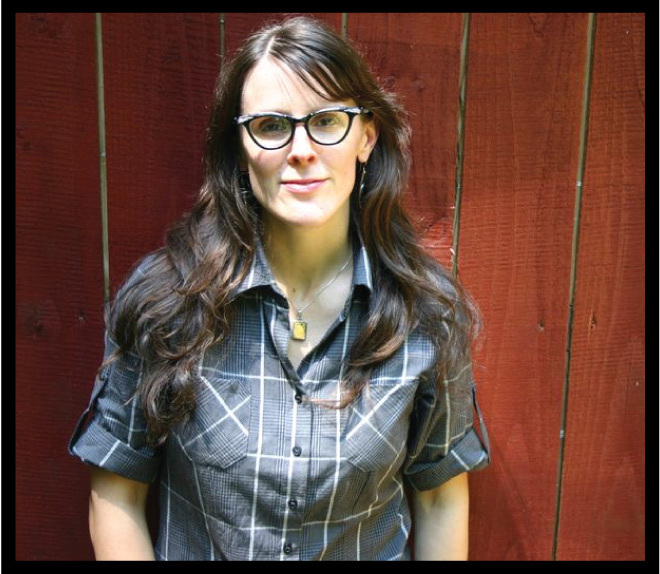 Ashley English, the voice behind Small Measure as well as author of several books, lives in a small Western North Carolina mountain community where she lives – and writes about – living a sustainable life off the land. 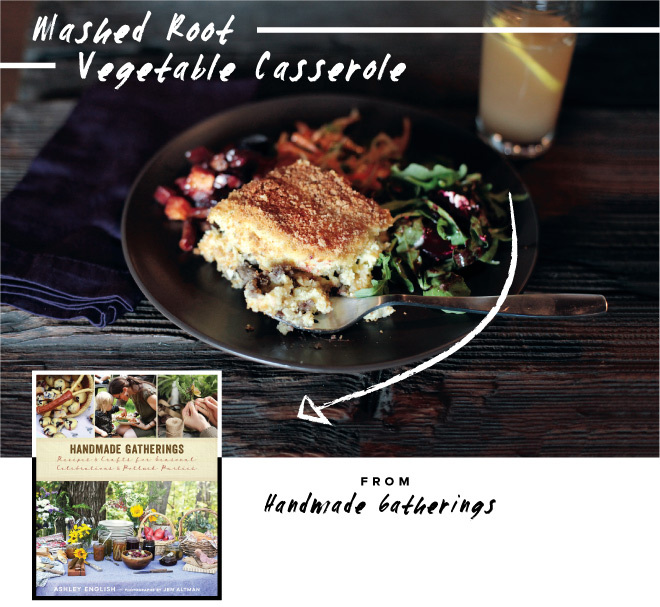 And if life in the mountains doesn’t give her the proper street cred for sharing the perfect fall food and cocktail recipes, then we don’t know what does. Bet you didn’t know that: I have a photographic memory. This came in especially handy in college, when I would simply mentally conjure up my notes come test time and be able to write down most of what my teachers said verbatim. I can also make remarkably good impressions of wild turkey calls and kitten meows (but not at the same time). When the chilly nip of autumn stays all day, turning frosty as the sun sets, this is exactly the sort of dish you want coming out of your kitchen. Celeriac and parsnips have a subtle sweetness to them, balanced here by an herbaceous, unctuous sausage filling. It’s filling and robust without making you feel weighted down after eating it. Comfort food at its finest. It also just so happens to go remarkably well with my Autumn Sangria! Lightly oil a 9”x13” baking pan. Set aside. 1) Bring 2 quarts water and a pinch of salt to boil in a large saucepan. Add the celeriac, potatoes, and parsnips and cook for 25 minutes. 2) Drain the vegetables and place in a large mixing bowl. 3) In a small bowl, beat the egg yolks. In a separate bowl, whisk the egg whites until frothy (beating the whites and yolks separately will add a bit of lightness to the finished casserole). 4) Using a potato masher or large spoon, mash cooked vegetables with the butter, cream, egg yolks and whites, salt, and thyme. Set aside. 1) Warm the olive oil over medium heat in a large saucepan or skillet. 2) Add the onion and cook until slightly browned and fragrant, about 4-5 minutes. 3) Add the garlic and cook until slightly browned, about 3-4 minutes. 4) Add the sausage. Stir to blend it into the onions and garlic. Cook for 5 minutes. 5) Add the allspice, thyme, black pepper, and salt. Continue cooking over medium heat until the meat has browned and is cooked throughout, about 5-7 minutes longer. 6) Add the flour to the meat mixture. Stir to fully combine and cook an additional 3-4 minutes, until the meat thickens slightly. Remove from heat and set aside. 2) Spread the meat filling evenly across the bottom of the prepared baking pan. 3) Spread the mashed vegetables evenly over the meat. 4) Bake at 375°F for 30-35 minutes, until the mashed topping just begins to brown. 5) Spread the breadcrumbs evenly across the top of the casserole. Return the baking dish to the oven and bake an additional 15 minutes, until the breadcrumbs are golden brown and the dish feels firm in the center. 6) Cool at least 15-20 minutes before serving. 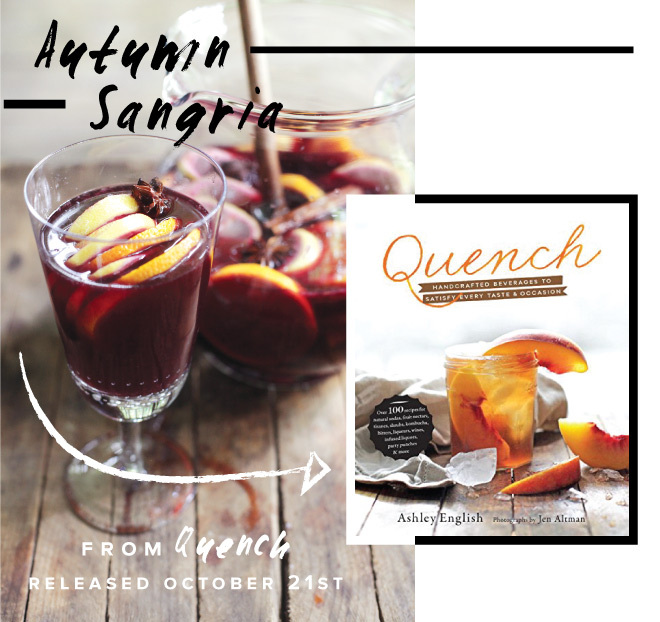 I have always loved sangria, and this autumn-inspired version might just be my most beloved. Fresh apples and pears are partnered with cinnamon, cloves, and juniper berries, offering a perfect blend of warming spice and sweet fruit. 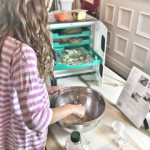 Pear nectar is readily available at grocery stores (look for Looza and Jumex brands), or easily made at home (like my recipe below, from Quench). *If apple brandy is not available, substitute with an equal amount of regular brandy. Combine all of the ingredients in a large glass bowl or container (such as a ½ gallon Mason jar or canister). Stir with a wooden spoon to fully combine. Cover with a lid, place in the refrigerator, and steep at least 4 hours, longer if possible. The longer the wine steeps, the more intense the flavors become. Serve in individual glasses with ice. Store any unused portion in the refrigerator. Use within 1 week.